Pack provides improvements to common sounds in the game, making them feel more immersive and real. 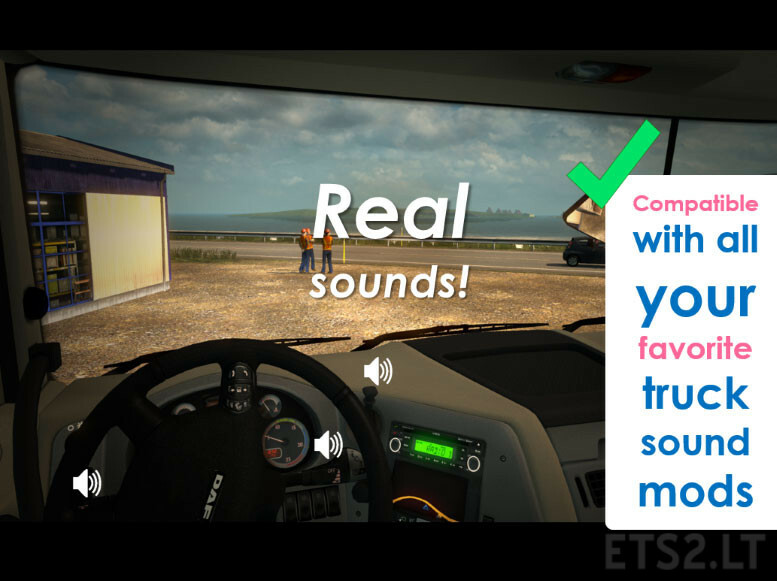 The goal of the mod is to make the game’s sounds feel like real life! Requires higher priority than map mods (e.g. ProMods, RusMap, etc.) 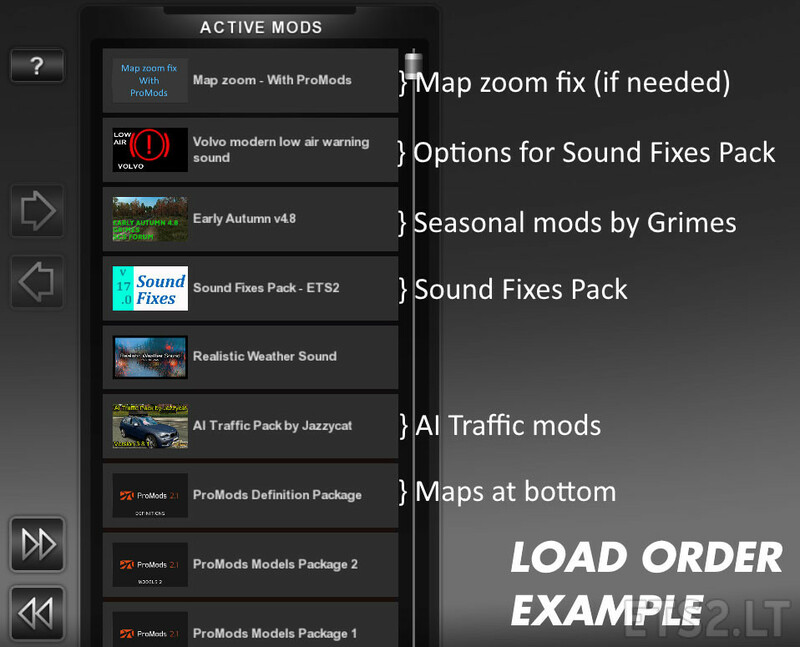 and AI traffic mods (e.g. Jazzycat’s traffic packs)! Tweaked sound range for hot air balloons. Updated def files with custom sound paths for American Truck Traffic Pack v1.3.3 by Jazzycat. 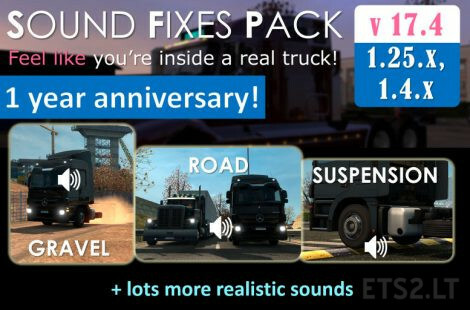 Some finetuning of generic/default AI traffic sounds for trucks and buses. Added 2 new gear grind sounds to array. Added 2 new environment sounds to array. Adjusted sound distance effect of helicopters. * Hard impacts can trigger key swinging sounds. * AI traffic trucks/buses given more variations of sounds (turbo, engines, gear changes). * Enabled sound for a vast amount of movers that don’t originally come with sound (e.g. F22 jet fighter, tugboats, hot air balloons, you name it!). * Suitable volumes of environmental ambience for various map mods. 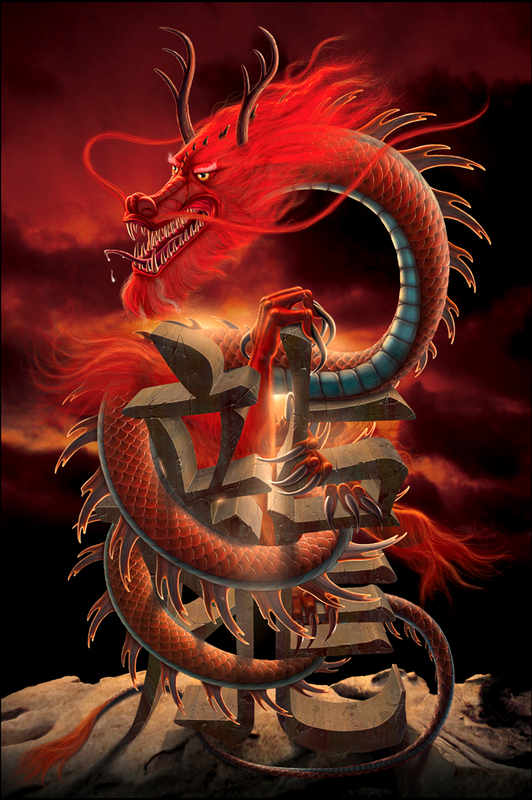 * ETS2 1.25.2 + ATS 1.4.2. No errors in game log. Must have high priority in Mod Manager. * Supports compatibility with Realistic Weather Sound 1.7.7 (provides realistic thunder + exterior rain sounds). Both mods can be enabled at the same time. Check the load order image included for more details. * If using winter mods, please enable Frosty Winter Weather Sound addon from Options folder of Sound Fixes Pack for full compatibility. Most likely an adapted Improved Weather Reload R6. CAN SOMEBODY PLS EXPLAIN THIS METHOD ??? Parabéns a Todos da Equipe pelo excelente Trabalho e também pelo Aniversario Felicitações a Todos…..